At the age of 21, two things happened to me: First, I was awarded my Science degree in Physics and then, I landed my first professional job as Quality Manager in a small firm. Looking back, I think I had no clue of how to manage this job properly. While I really wanted to "do a good job", I stood in utter ignorance of good management skills. I had great knowledge of physics but no business training. But as the quote goes, "Never limit your challenges, rather challenge your limits", I decided two years later to emigrate to Germany. And so, one freezing night in January 1987, I landed in Munich, rucksack on my back, to "give it a go". What was supposed to be an adventure of a few months, turned out to be nearly half a lifetime. My experience with German companies was immense. Wherever I went, they believed in training and in supporting the advancement of employees. Colleagues and managers alike believed in sharing information and encouraging you always to do better. I was exposed to many, many challenging situations and I grew as I met these challenges. When I did my MBA, I realized that had someone given me the opportunity to learn management methods and techniques earlier, I could have managed so much more and better - to the benefit of employers. As a fluent German speaker, I managed projects on a worldwide basis, on topics such as Quality Management but also in Training and learning, problem solving, process management and business coaching. After 22 years of working with Global partners for these German companies, I returned to Ireland with my little family and have since set up "Business Online Learning". With this background, my business is set up with the aim of supporting others. My goal is to help employees and managers alike. I want to see people progress in their lives. A natural born educator, my belief is that with easier access to these techniques and methods, I can help employees and their employers advance at a faster pace. So do you have some important project in the pipeline but don't have the in-house expertise for it? Speak to me about the virtual expertise service I provide. and training in of those involved. After so many years of providing businesses with this holistic approach, I can say that I am effective, flexible and reliable - ready & waiting to be your partner. In-house training or provision of business training videos. Speak to me. You will be delighted you did. 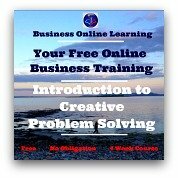 PS: On this website there are over 170 pages of Business Training Information, you can find out more here.